Named for its, do all  plow over everything ability, the Slingshot FARMBOY's all purpose design handles like a 26"  but rides like a 29". Yee-haw! At the heart of the Farmboy remains Slingshot's SPT (Sling Power Technology)  an energy returning system which utilizes a composite flex board, stainless cable down tube and a spring to provide the rider with un-matched performance and comfort. New to the Farmboy, is a field fixable flex board. Shaped like a "dogbone" the board is easily installed without the use of glue (as on older models) allowing the owner to self-service the bike if board replacement is required. This process used to require the owner to ship the bike back to Slingshot for service. The front "Boomtube" - or top tube; is a new, oversized custom design which is engineered to optimize performance while remaining lightweight. Made of 7005 aluminum, the boomtube provides tremendous stiffness, while driving trail shock directly to the dogbone board. The rear end of the Farmboy is a custom Reynolds 853 steel with both canti and disc brake tabs. Slingshot began making 29" bikes in 2002  ahead of the current craze  and believes the big wheel is here to stay. "We feel that the 29" is the do-all platform for riders who are looking to get the most riding options out of one bike," said Scott Templar from Slingshot. To provide the customer with more choices, Slingshot will also be offering a variety of custom options at some point in 2006 which include single speed dropouts, custom sizes, colors and a carbon fiber rigid fork. 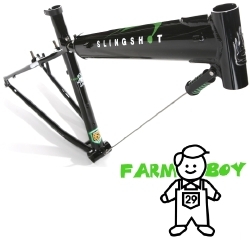 The Slingshot Farmboy frame is priced at $1,200, and is currently in stock and ready to ship. The Farmboy is available in 16", 18" and 20" frame sizes. See your local dealer for more information and to request a test ride.